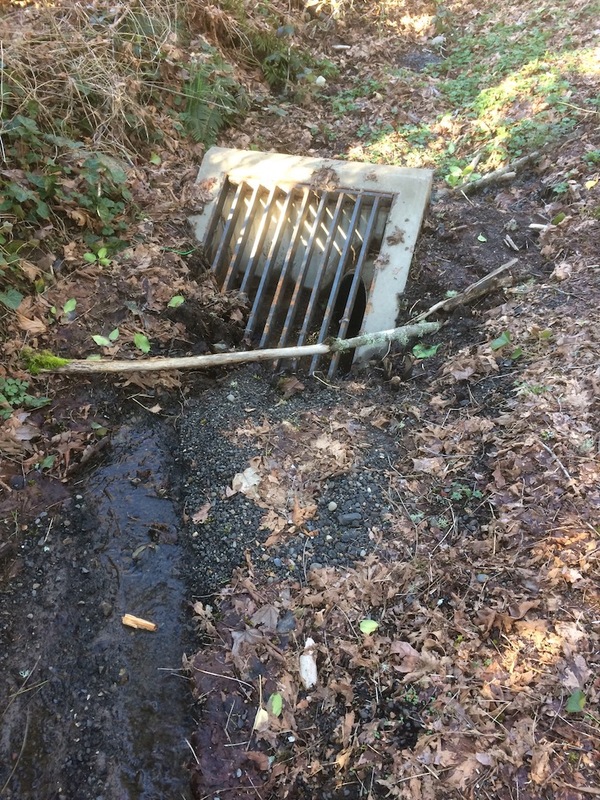 The city recently posted a plea for help keeping the city's 58,000 storm drain grates clear of leaves... The crews simply can't reach all of them in the short after the rain and leaves begin to fall. 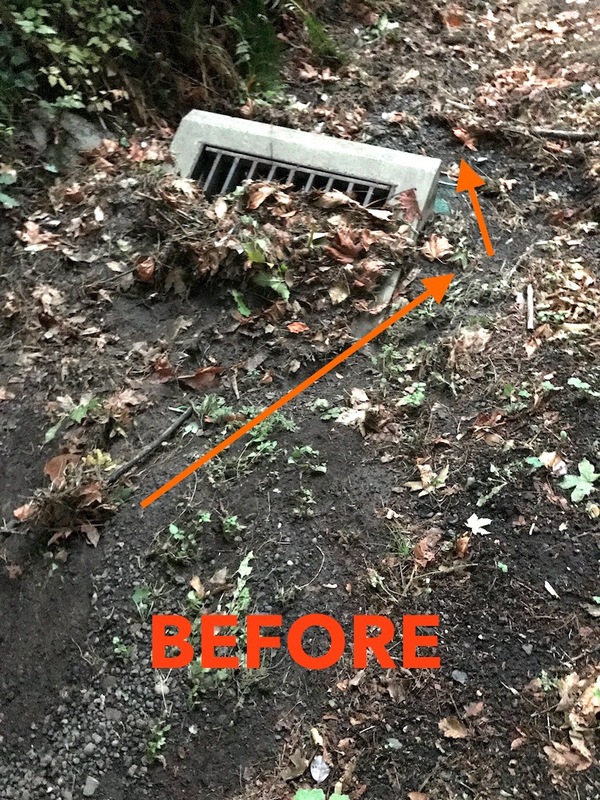 Last year I adopted a Grate down hill from our driveway on SW Boones Ferry Road. I'm posting Before & After photos to show what a difference it can make. Please consider adopting a storm drain near you! Without attention, the grate gets clogged and becomes ineffective. Water goes elsewhere causing erosion damage. (In this case, it would undermine the road). Here's the grate on just up hill from the traffic diversion triangle at Taylor's Ferry. 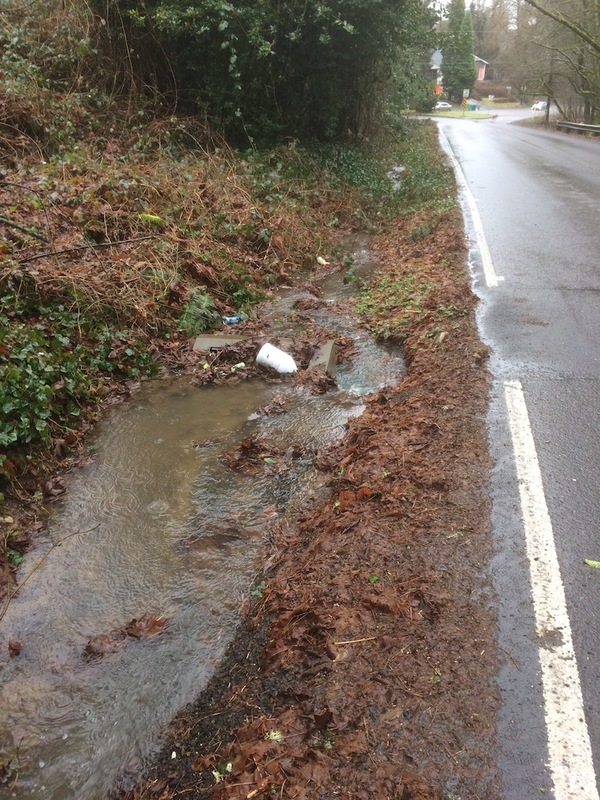 The water is bypassing the drain, and flowing dwon the ditch where is will encounter another drain that is clogged. Were the water's supposed to go: Into the grate and then into a large pipe that runs under the road. See the break in white fog line? That line was interrupted when the pipe was installed a couple years ago.) The pipe/conduit emerges above the bank of a branch of Stephens Creek, and the water flows to the creek — basically where the water would have drained to before modern road makers changed the drainage pattern. What To Do? First, clear junk and leaves away from the grate. This lets water flow freely into the drain. It's fun! Then you may need to repair the breach. Sticks, rocks, and mud were used to repair the breach. This will remain in place for some time — as long as the water has an easier path to flow. See below. 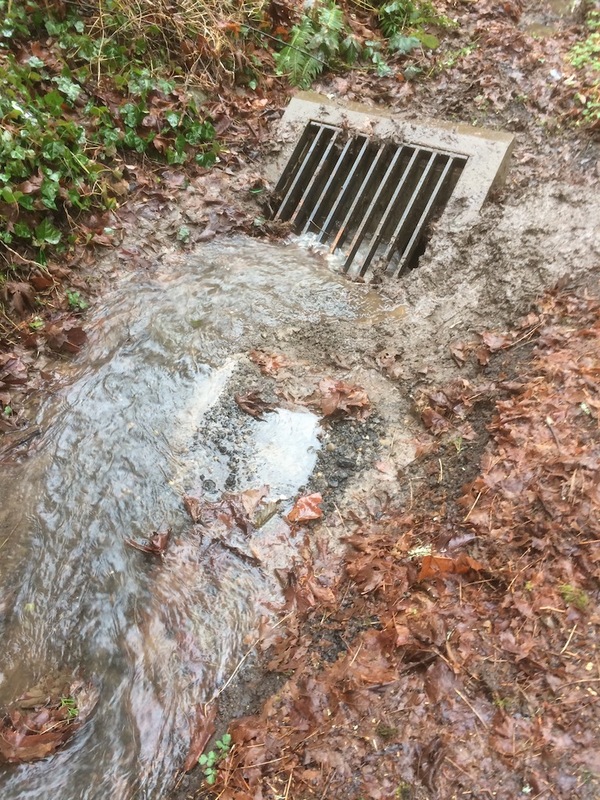 Now the water flows into the grate, goes under the road, and is discharged into a tributary to Stephenson Creek, which flows into the Willamette River. Here it is one month later without any attention. It has settled down because the grate is clear. Recheck the grate during winter rains. Try placing somethings (such as pine boughs) uphill from the drain to catch and hold leaves before they make it to the grate, and then tend those catchers as well. The city uses netted bags of barkchips. I also noticed a sinkhole in the ditch a hundred yards uphill, were water disappears! I put a sign-on-a-stake there, and reported via PDXReporter.org. Within two days, the report was forwarded. I got a response thanking me, saying they were going to check it out. Downhill from here, there are other drains. Portland's Eastside has more level streets network with grates at the corners, etc. If they clog, they have a huge puddle that cars splash through. Most West Hills streets and roads don't have sidewalks with curb-gutters. Instead they may have a simple ditch along one side of the road. The ditches may have an occasional storm drain to carry the water to the Willamette or a tributary. This was in September after the first downpour. This is fixed up again. 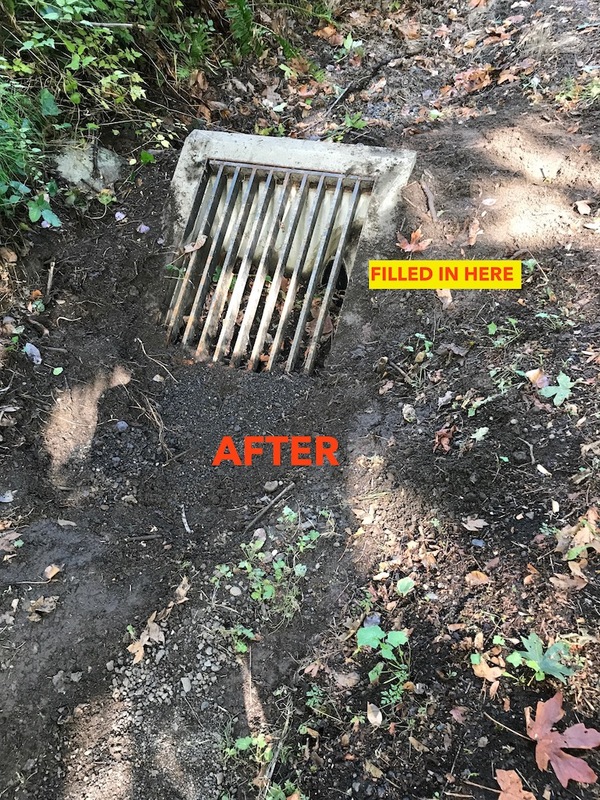 More "permanent" fill material is needed there to prevent erosion, but if the grate gets clogged, the rain would breach up on over the drain. Don't try to lift storm drain grates. They are very heavy. Let the city crews handle garbage or any hazards in the catch basin. Clear surface debris only. use the online form at www.pdxreporter.org to report it.